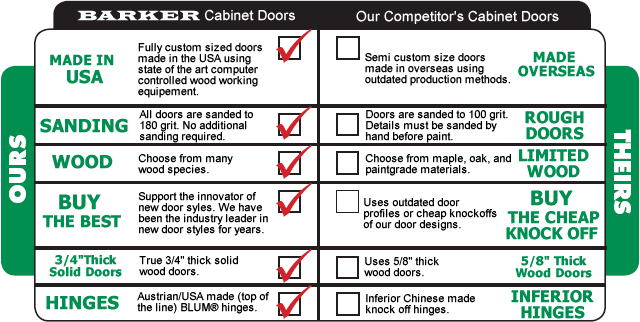 Today Barker Door manufactures all cabinet doors in Tualatin, OR. Utilizing a multi-million dollar door manufacturing facility. Barker Door has created a way for contractors, designers, and do it yourself homeowners to create great looking cabinets at a fraction of the price of local suppliers. Building cabinet doors has been a passion of ours for quite some time. We are able to offer super fast production times by streamlining technology and minimizing wasted time. We do this by coupling high tech machinery with our online cabinet door marketplace (barkerdoor.com). When you submit your order, we immediately begin generating your cabinet doors and drawer fronts in our state-of-the-art production facility located in Portland, OR. By keeping our lead times low, and our efficiency high, we are able to offer incredibly low prices on cabinet doors and drawer fronts. Our pricing is calculated based on the popularity of each door style as well as the raw material wood costs. This pricing system allows us to produce our most popular cabinet doors super fast while keeping our quality inconceivably high. The quality of our cabinet doors was formulated through extensive experience in building high-end cabinet projects since our company was founded in 1978. We hand sand every door that leaves our cabinet door shop. Every door is shipped ready for paint or stain. With such close attention to detail, the quality of our doors is unmatched in the cabinet door industry of today. Barker Door ships to the USA and Canada. We have partnered with FedEx to provide super fast ground delivery on all of our cabinet doors and drawer fronts. This unbelievably fast ship time, coupled with our lighting fast production time, allows our customers to receive their doors at speeds that most may think impossible. Best of all, our super fast cabinet door production speed is included in every order at no extra charge. 503-476-1060 ALL PRICING AND ORDERING MUST BE COMPLETED VIA OUR WEBSITE, WE DO NOT QUOTE OR TAKE ORDERS OVER THE PHONE.